Tonight's the night! The seats are filled and the lights are dimming at Radio City Music Hall, which can only mean that it's time for our favorite part of the Tony Awards: ranking the fashions. 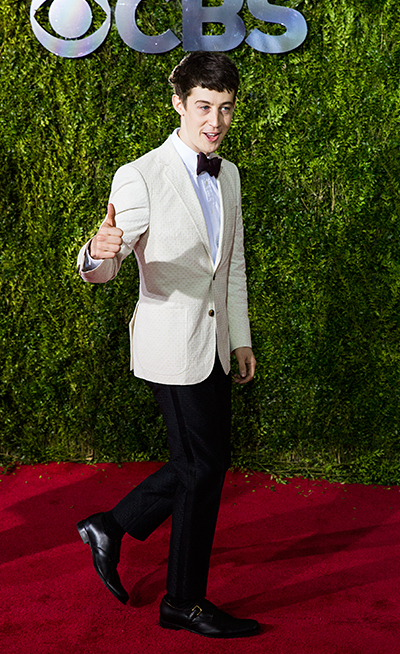 After poring over Broadway's brightest on the red carpet, we've picked our five best-dressed men and women from the 2015 Tony Awards. Whose looks did you love most? Let us know in the comments below! What's a lady is a lady to wear, when she's doing Tony double duty as both a co-host and a nominee for Best Actress in a Musical? For On the Twentieth Century's Kristin Chenoweth, the only solution is to shine as bright as a Tony Award itself, in an intricately beaded, totally bodacious silver number from Zac Posen. Is The King and I star is channeling a little Anna with her fashion tonight? O'Hara's ankle length brocade-inspired dress has all the charm and elegance of her character's famously flouncy gown, but with a streamlined shape and sleek black and gold color palette for a modern appeal. Thank heaven for Naeem Khan! Gigi star Hudgens, who will join her cast to perform during tonight's show at Radio City, is the picture of springtime in the designer's flowing, watercolor floral print. The Tony-nominated Fun Home star is the picture of perfection on her first red carpet! Lucas' deceptively detailed ecru dress by Erin Fetherston is a perfectly cut, and the subtle tone-on-tone pattern makes it feel sophisticated without being too grown up. Well played, Sydney! It may be a Sunday, but the Hand to God nominee is no Sunday school puppet theater teacher tonight! Carr looks like the star she is in this sleek, mermaid-cut dress by Theia, and the stop-in-your-tracks-red is every bit as stunning as the carpet she's walking. Sharp, Tony-nominated star of The Curious Incident of the Dog in the Night-time, looks good enough to touch in this textured suit from Billy Reid! It takes a bold man to pull off a white jacket, and we happen to think Sharp is doing one hell of a job. 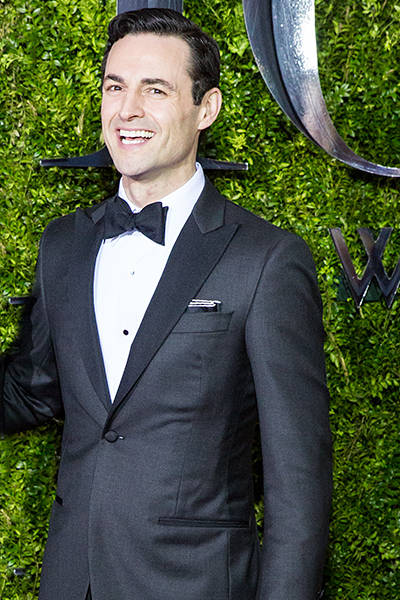 Some men can just wear the hell out of a tuxedo, and Andy Karl is definitely one of those men. His Kenneth Cole duds are the height of classic, and his gorgeous wife Orfeh on his arm doesn't hurt. Now here's hoping he can keep his hands off the Tony host (and his hands-on On the Twentieth Century co-star) Kristin Chenoweth! 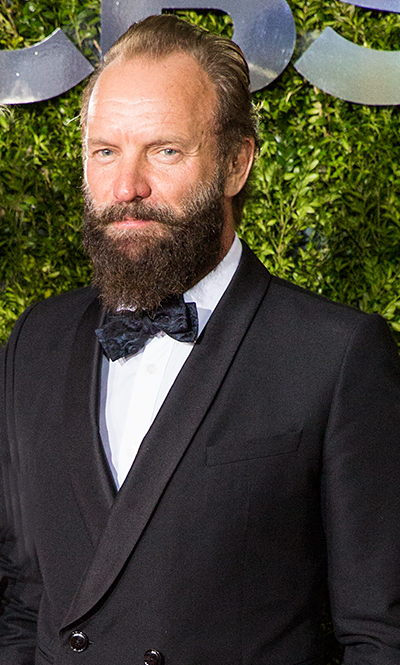 No matter what you think about the beard (we happen to think it's Abraham Lincoln chic), there's no denying that the Tony-nominated composer of The Last Ship is rocking this double-breasted jacket like, well, a rock star. Never change, Sting. Maybe he's picked up a thing or two from starring in An American in Paris, because this nominee is looking every bit as sharp as his Parisian character in this sharp, tailored suit from Brooks Brothers. Before the Finding Neverland star blows the roof off of Radio City peforming alongside his co-star Kelsey Grammer, he stormed the red carpet in his suave, signature style. And, as always, his best accessories are an extremely jaunty pocket square and that Morrison smile.